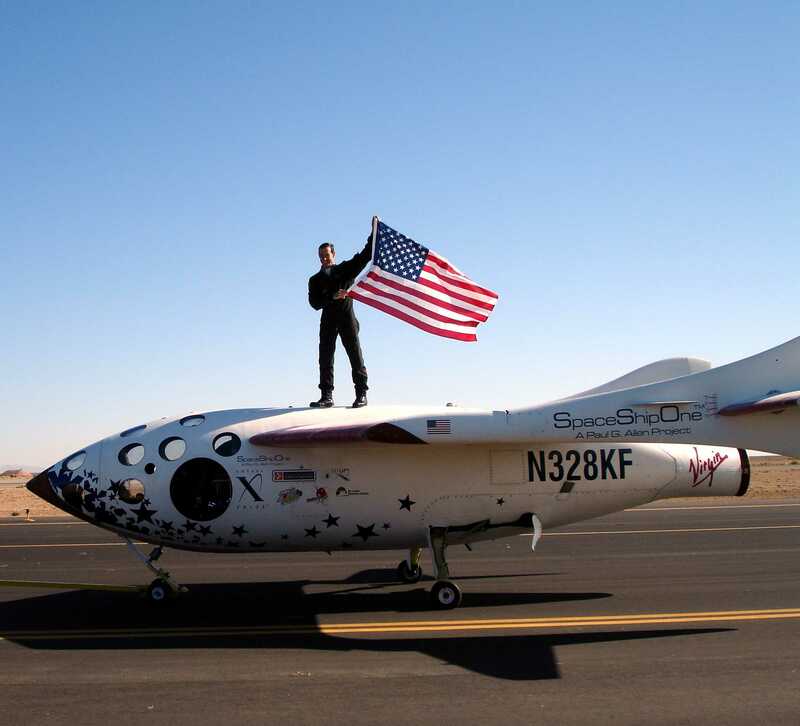 October 4, 2004 — Mojave, CA — SpaceShipOne, with astronaut Brian Binnie at the controls, flew into space to win the coveted Ansari X-Prize and the $10 Million purse that goes with it. The prior week, Mike Melvill had successfully completed the first X-Prize flight (called X1). 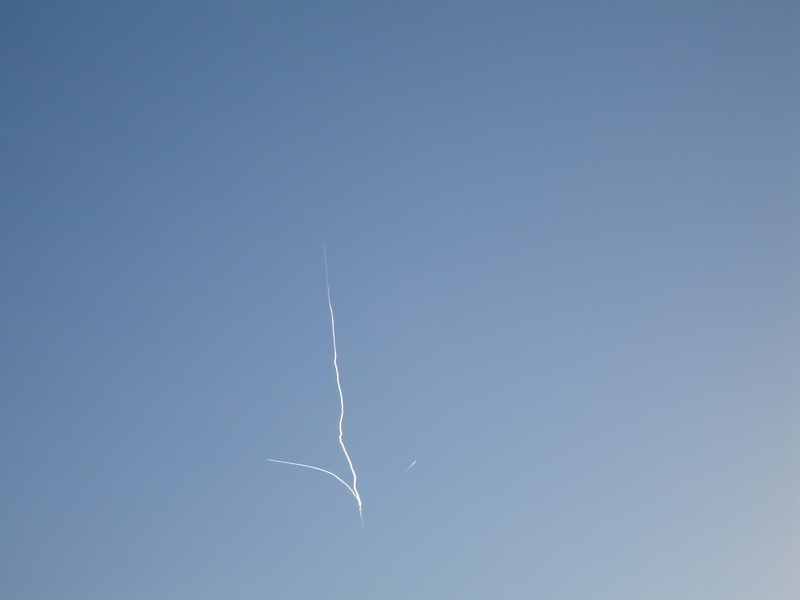 Now it was all up to Scaled Composite’s test pilot Brian Binnie to fly the X2 mission into space. The requirement to win the X-Prize was to make the second X-Prize space flight within two weeks of the first, but the decision was made to try after only one week to allow time for another attempt in the event that this flight didn’t make it to space. We were there that day and took the photos in this blog entry. I was so eager to see that event that we were the first civilian car into Mojave Spaceport that day. A large number of Burt Rutan’s family had to sit behind us. 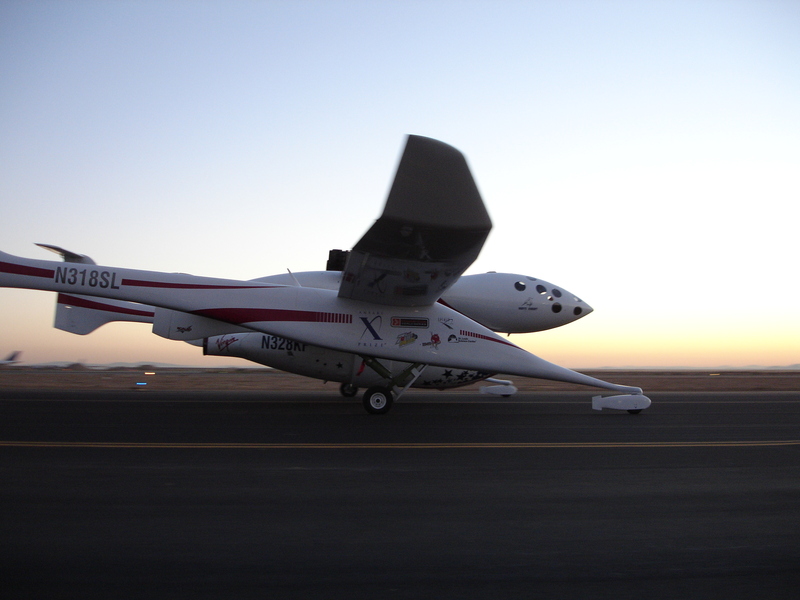 Just after sunrise White Knight (the carrier aircraft) started down the taxiway right in front of us, with SpaceShipOne attached underneath. I knew that history was being made so I took as many photos as I could. It took White Knight about an hour to make it to “drop altitude” – just over 50,000 feet. Then the drop was made, and SpaceShipOne’s engine kicked in to propel the stubby-winged spacecraft into space and into history. Brian Binnie beat the X15 altitude record for winged aircraft that day, and Paul Allen, Sir Richard Branson and Burt Rutan joined Binnie with a champagne celebration and a brief ceremony as they received the X-Prize. After the dust settled I went to the local post office (which is nearly at the end of the runway) to have some special commemorative covers canceled. 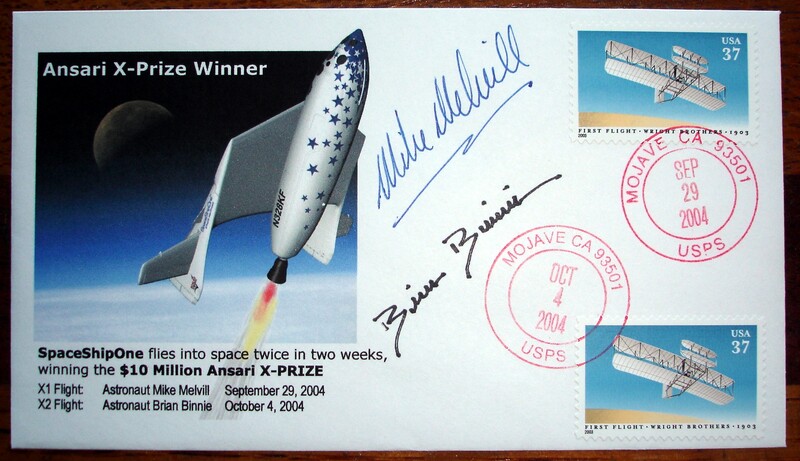 They had also been canceled on the previous SpaceShipOne X-Prize flight just a week before, so it commemorates both of the X-Prize flights on a single postal cover. This entry was posted in Leadership lessons from the Space Race, Space Race Memorabilia and tagged business, leadership, management, motivation. Bookmark the permalink.